One of the best restaurants in Airlie Beach, Mr. Bones offers awesome views of the Airlie Beach Lagoon and some delicious meals. A must visit when in the area; the restaurant is known for its delicate pizzas and drool-worthy desserts. 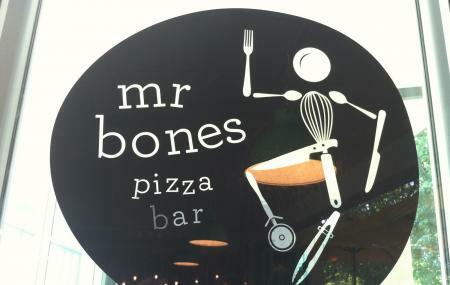 Mr. Bones is family friendly and kids enjoy their time there. It is an Airlie Beach institution offering great fare at great prices in a tapas style restaurant. Do try their signature “Dessert Burger”. Visit here in the daytime to enjoy the stunning views. The restaurant is known to be kid-friendly. How popular is Mr. Bones? People normally club together Bicentennial Walkway and Airlie Beach Lagoon while planning their visit to Mr. Bones. Chill and cozy place to have a drink or two. Good view of the far ocean! while biting your pizza.. Outstanding brunch!!! Some of the best sourdough I have ever tasted before. Will definitely stop by again for lunch/dinner. Very busy place and try to be there early. They even used up all their ingredients once when I visited. Strongly recommend the lamb pizza. If you want to order their ice coffee, make sure to order it with the ice cream, it'll taste much better that way. Very friendly staff. Tasty and thin crust pizzas at average prices for the area. Will definitely go back !